It’s the first episode of 2018! As usual, Episode 26 can be found on PodBean, iTunes, or Stitcher. This episode is unique. In fact, it is really out of this world (okay, that’s the only bad joke, promise). We examine the scientific field of astrobiology – life among the stars – barely scratching the surface of this fascinating and still growing field of study. An artist’s rendition of the upcoming Mars 2020 rover as it searches for potentially habitable areas on the red planet. Image from NASA/JPL-Caltech. The focus of this particular field of science is to answer such unique questions as: How does life begin and evolve? Is there life elsewhere in the universe? What does this mean for the future of life on Earth and beyond? The question of “Are we alone in the universe?” has been asked by humans long before the science of astrobiology was established. Image by NASA/Lynette Cook. To answer such complex questions, the people who study this subject turn to many different sciences and techniques, from biology to astronomy, paleontology to chemistry, and more. 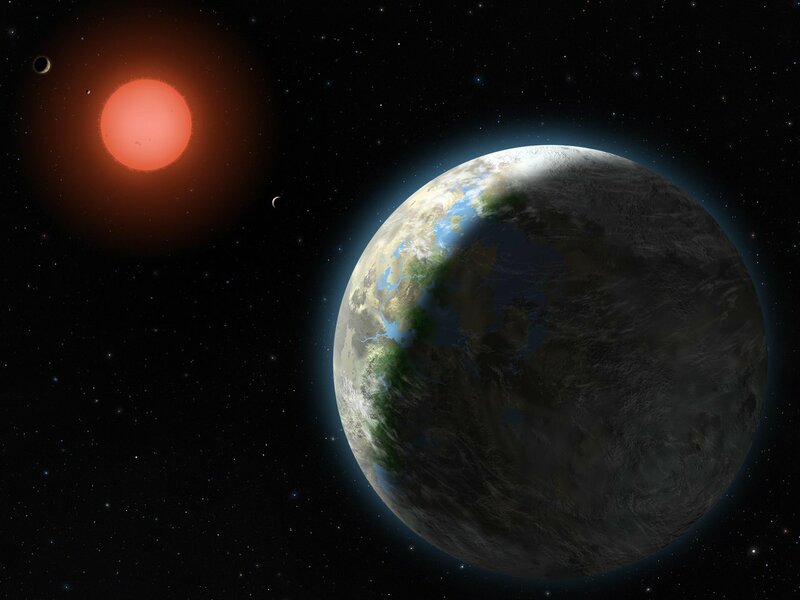 This includes direct approaches such as searching and observing other planets to look for evidence of life, as well as more subtle techniques like investigating the early history and origins of life here on our own planet. There have been numerous NASA missions that have aided in the search for life on other planets, as well as few that were specifically looking for life. This is one of the Viking landers that was launched in 1975 to look for life on Mars. Image by NASA/JPL-Caltech form NASA Image of the Day. Direct missions to other planets include both probes and rovers, the most recent being Curiosity, which has the mission of identifying whether or not Mars could have once been habitable to life. 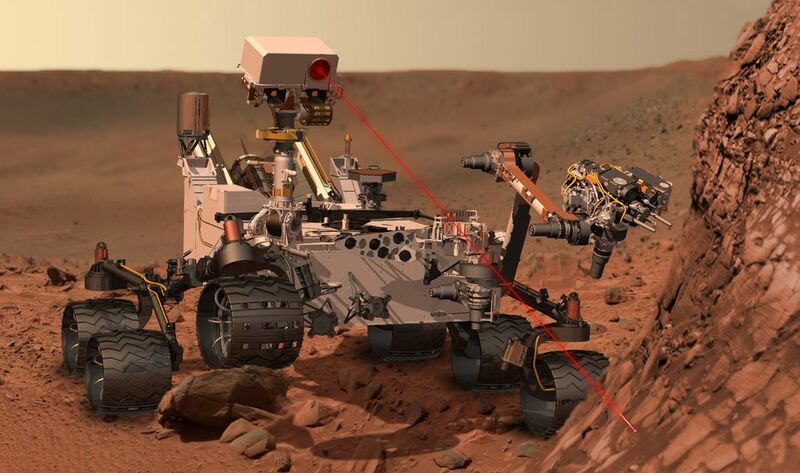 Artist’s concept depicting Curiosity as it examines a rock’s composition with its ChemCam (Chemistry and Camera instrument). Image by NASA/JPL-Caltech. There are also plenty of alternate approaches in the search for life. One of these is SETI (Search for Extra-Terrestrial Intelligence), an organization with the mission to listen for alien transmissions using radio telescopes. Though the chances are extremely low that we will catch an extraterrestrial radio show – check out the famous Drake Equation to see why – they continue to listen and there is even a program in the works to start looking for artificial light given off by alien civilizations. The Drake Equation breaks down the (mostly unknown) factors that would affect our chances of receiving a signal from possible intelligent alien species. Image by Mohammad Alrohmany, Wikimedia Commons. Another famous endeavor searching for potential locations of alien life is the Kepler Mission. 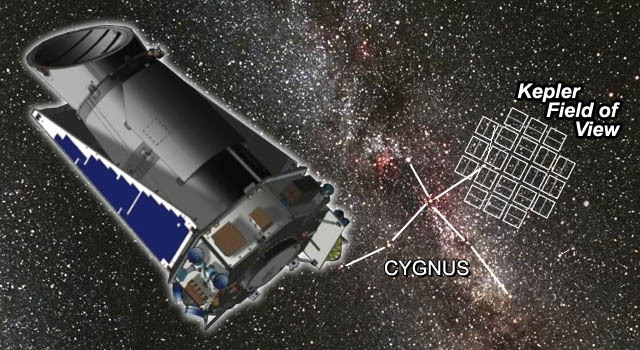 The Kepler space telescope currently orbits Earth while aimed at a single point in space searching for planets orbiting other stars. Exoplanets have only been a scientific fact for just over 20 years, and in that time Kepler has discovered over 2,000 planets in other solar systems. Future missions plan to continue this search. Kepler is only examining about 0.25% of our visible sky, and has identified thousands of potential exoplanets and moons. Image by NASA/JPL. So far the two bodies getting the most attention in our solar system are Mars and Jupiter’s moon, Europa. Both have evidence of containing liquid water, which is a key feature for astrobiologists since it is one of the few things that all life on Earth seems to truly need to survive. 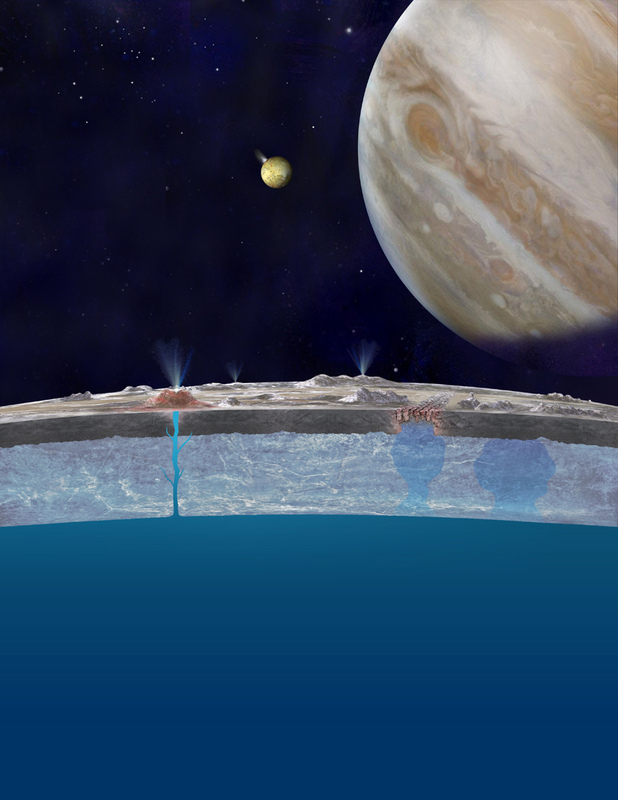 An artist’s concept of Europa’s frozen oceans and the spouts of water that have been observed on its surface. Image by NASA/JPL-Caltech. Astrobiology here on Earth tends to focus on what habitats can support life, and how the only known life in the universe (so far) got started. Extremophile microbes are prime indicators of what the limits of life might be. These hardy organisms specialize in living in very harsh environments, and can even form the basis of ecosystems devoid of sunlight (such as hydrothermal vents and caves). These give us clues as to where life can persist, and perhaps where it originated. Some of the biggest questions in astrobiological research deal with how life began on Earth and how inanimate molecules can lead to life. This is known as abiogenesis, or the natural process by which life arises from non-living mater. How this happens is still being studied. Studies on this subject look to answer how organic molecules form in nature, and how they can come together to form biological structures. Meanwhile, paleontologists search the fossil record for remains of early life, the most ancient of which (so far) are stromatolites dating back 3.5 billion year. There is much-contested potential evidence of life going back at least 3.8 billion years, and maybe more. A cross-section of a stromatolite showing the layers of microbe growth. Image by James St. John from Flickr. Of course, the question of life’s origin is complicated by the question of what exactly defines life. This is a huge subject! If you want to hear more along these lines in the vein of paleontology and evolution, let us know! If you’d like to read more about astrobiology you can also take a look at the Astrobiology Magazine. I got to see a presentation from Prof. Potter of the Beringian study. Very cool. Also it is Tan-ah-nah Valley. That is very cool. And thanks, we’ll make a note in case it comes up again some day.